As may you know Snaky Lane is home to a couple of reptile species, although that’s not how the site got its name. You may have spotted what look like discarded pieces of corrugated iron and roofing felt dotted around the site. They serve an important purpose in giving our reptile friends somewhere safe to hide whilst getting their bodies up to temperature from the spring sunshine. 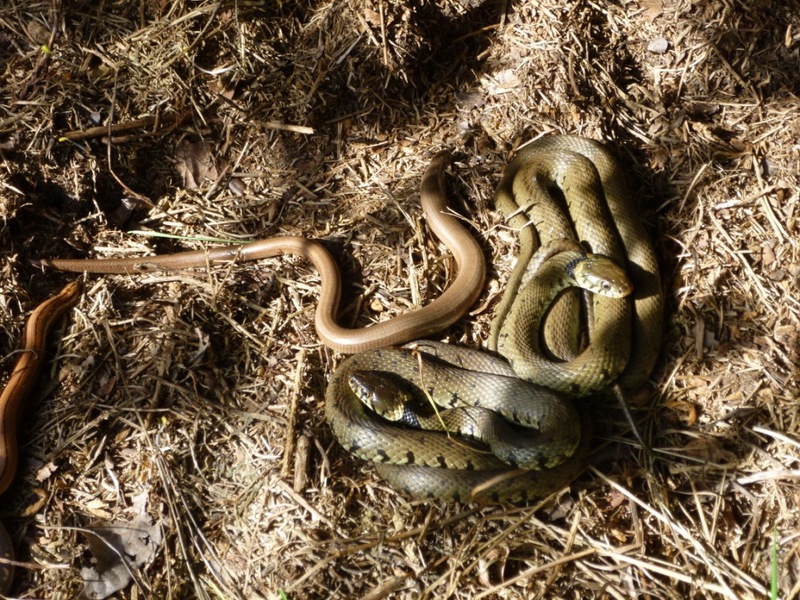 A quick peek under one of the tins on Sunday revealed this beautiful sight – two grass snakes (green) and two slow worms (brown). Proof that our reptile population continues to thrive. There have also been sightings of common lizards in gardens close by, although as far as we are aware, we’ve never seen a common lizard yet on Snaky Lane although we are sure there must be some. Have you ever seen a common lizard on Snaky Lane? This entry was posted in Conservation, Wildlife and tagged grass snake, Lizard, slow worm, snake, Snaky Lane. Bookmark the permalink.